The Dermatology Clinic offers a number of dermatologists renowned for their innovative skin cancer treatments and positive long-term outcomes. The clinic can assess and treat virtually any type of skin cancer diagnosis including melanoma, basal and squamous cell carcinoma, among others. 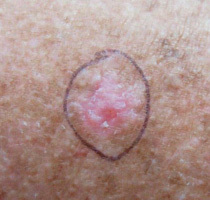 Actinic Keratoses are not skin cancers. Sun damaged skin becomes dry and wrinkled and may form rough, scaly spots, called actinic keratoses. Because they sometimes may turn cancerous, it is usually recommended to remove them. If a person has multiple actinic keratoses that change, bleed, or are enlarging, they should consider removal. Actinic keratoses can be removed surgically with scissors, a curette (scraping instrument) or by way of freezing them with liquid nitrogen. Healing after removal usually takes 2 to 4 weeks, depending on the size and location of the keratosis. Results are generally very cosmetically pleasing. You should avoid excessive sun exposure to avoid future AK’s. Basal Cell Carcinoma’s are the result of sun damage to the skin. They are best treated early, when they are small, because it is simpler to remove a small growth than a large one. Surgical removal of basal cell cancers is almost 100 percent curative. Basal cell cancers enlarge steadily, but do not spread to other parts of the body or spread internally. Microscopic examination is necessary to determine whether a growth is cancerous. Mohs Micrographic Surgery is a highly specialized treatment for the total removal of skin cancer. This method differs from all other methods of treating skin cancer by the use of Complete Microscopic Examination of all the tissues removed surgically as well as detailed mapping techniques to allow the surgeon to remove all of the roots and extensions of the skin cancer. The procedure begins after the skin is injected with a local anesthetic to make it completely numb. Then the visible cancer and a very thin layer of surrounding skin are removed with a scalpel, carefully mapped, and examined microscopically. If there is still cancer seen under the microscope, another very thin layer of skin is removed from that exact location. This may be repeated as often as necessary to completely remove the cancer. Squamous Cell Carcinoma is an uncontrolled growth of abnormal cells arising in the squamous cells, which compose most of the skin’s upper layers (the epidermis). SCC’s often look like scaly red patches, open sores, elevated growths with a central depression, or warts; they may crust or bleed. SCC’s may occur on all areas of the body, but are most common in areas frequently exposed to the sun. Melanoma, also called malignant melanoma, is a serious skin cancer. Melanoma develops from the pigment-producing cells of the skin, called melanocytes. Melanoma is dangerous because it can spread to a distant part of the body (metastasize). If melanoma is treated before it metastasizes, it is curable. Early diagnosis and treatment is extremely advisable. Melanoma is most common in those with a history of repeated severe sunburns in childhood. Melanomas are almost always colored and resemble a mole. The only way to decipher between the two is to have the growth surgically removed and examined microscopically. Because this cannot be done for every colored spot on your body, there are guidelines for which growths must be seen by a physician. Their borders are usually notched or angular, and their color varies in different parts of the growth. 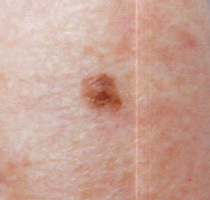 Melanomas tend to be asymmetrical, have an irregular border, have variations in color, and have a diameter of more than 6 mm (1⁄4 inch).